When the Boy’s and Girls’ Schools were located at The Angel, Islington, N1, students had to make their own way by public transport to their playing fields. These were located in Chandos Avenue, Whetstone, N20, some 8 miles away. The 10-acre site contained a handsome Edwardian style redbrick pavilion together with a groundsman’s house. The playing fields were laid out to provide one junior and two full sized pitches, a cricket square and some tennis courts. In the spring term, when the boys’ school concentrated on athletics, a 440-yard grass athletics track was laid out. The school allocated half day playing times each week to the various sections of the school. These grounds were retained by the Schools until both Schools were transferred and combined at the existing site in Potters Bar. At this new location the School was to have its own sports grounds on site. As a result, the Chandos Avenue site was no longer needed. It was sold to the London Borough of Barnet, who retained its use, but as a municipal facility. Although by the end of the 19th century the Old Boys had established several Sports Clubs, they did not have their own grounds. Even though the Football Club had become a strong force in the amateur football hierarchy of North London, it had to play its home matches on rented pitches, such as Highgate playing fields. So in the early 1900s a group of football club members decided to establish their own facilities, led by some very active pioneer members. The group managed to secure a 6-acre freehold site almost opposite the School ground in Chandos Avenue. On this site was constructed a modest timber building. This building was to be the licensed clubhouse and changing rooms for several decades. The grounds themselves were transformed so as to provide soccer, cricket and tennis facilities. In order to establish a legal framework for the ownership of the site, a registered company, Old Owen’s Sports Club Limited, was formed. The company then raised money by way of loans from the club members. In return the members were issued debentures. These constituted an obligation by the company to pay interest on the loans, and at some stage for the debentures to be redeemed. As far as can be seen, these obligations were never enforced by those founding members. The limited company became the legal owner of the grounds, and was therefore entitled to charge the Old Owens Association rent for its use. This was only ever done at a nominal amount. Soon after the 1939/45 war, a prefabricated bungalow was purchased and erected. This was to provide accommodation for a groundsman or steward. Around 1950 it was decided to appeal for funds to build a brand new brick built pavilion. The Association’s members responded generously and the new pavilion was completed in about 1952. A small proportion of the land was sold in order to provide funds for further ground improvements. In the 1960’s, when it became clear that the school would be moving to Potters Bar, the committee decided that it would be unlikely that the Association could attract sufficient new membership from pupils leaving the new school to maintain viable Sports Clubs at Chandos Avenue. It was therefore decided to establish new facilities in Potters Bar so as to sustain the life of the Association and its constituent Sports Clubs. A special general meeting of the Association was convened and, although there was some disagreement, it was nevertheless accepted that the Chandos Avenue site should be put up for sale by tender. Without such a sale the Association would not have the funds needed to bid and pay for land at Potters Bar within what was perceived as an appropriate catchment area for the new School. There was a good response to the marketing, particularly from various sports clubs, house builders, and even from retail organisations such as Tesco and B&Q. Although the latter two categories offered the highest prices, such use would have required planning consent. From considerable lobbying of the Local Planning Authority by the Association, it became clear that such use would involve a very long process of applications and appeals, and even then consent was very unlikely. Fortunately, however, there was an unexpected bid from a group named the Harringay Meeting Room. We discovered that this was a somewhat obscure religious group that wished to establish a church/social facility in a location that afforded privacy. The group offered to pay almost £900,000. Furthermore, the group agreed to a 12-month delay from contract signing to completion. This would give us time to establish new facilities, and minimize the disruption for the Sports Clubs that the move was likely to cause. Since the offer was unconditional and we knew the group had the finances available, the sale was agreed and successfully concluded within a short time span. The committee undertook a detailed search for a suitable site, including approaches to the major landowners in the area and to the Local Authority. None of these proved successful but from a direct contact the committee found that the current 10-acre site at Coopers Lane might be up for sale. A deal was successfully agreed and an appropriate planning application was submitted. However, despite having received early encouragement from the planning officers, the Association was both surprised and extremely disappointed to receive a notice of refusal from the Welwyn and Hatfield Council Planning department. This refusal was on the grounds of both the loss of agricultural land and the intrusion into the green belt, and this could not be justified because the new use would not be of benefit to the local community. The Association appealed in 1985 and appointed a leading expert on agricultural usage, Michael Bonnington, to represent the Association at the subsequent planning inquiry. He argued authoritatively that the land lacked the quality and size necessary for viable agricultural use. It was also pointed out, by the Association, that many of it’s Members lived in the area, and in particular that pupils attending Dame Alice Owen’s School were all potential users of the ground. Evidence was also presented to show that several local Sports Clubs were in desperate need of facilities. Therefore, to counter the argument that a Sports Ground would not be of benefit to the local community, the Association undertook to make the use of its facilities available to other local organisations. It was also contended by the Association that the Council’s rejection because the Coopers Lane site was at the southern end of the Council’s area and their decision was based very much on a parochial view that the need for the facilities was nothing to do with Welwyn & Hatfield Council, whose offices were well to the North of the site. The Inspector accepted all of this evidence and in a short time consent was granted. The committee next drew up a brief to illustrate the space needs of the Association for refreshment and dressing room accommodation, plus a groundsman’s house. Architects were duly appointed to carry out the design. An application based on this design was submitted to Welwyn & Hatfield Council, but the Council continued with its uncooperative approach by imposing such limits on the hours of use, which would make it almost impossible for the Club to offer the normal hospitality and refreshments that users of the ground would expect. It seemed that these imposed conditions were to placate local publicans who were opposed to what they saw as a potential loss of trade. Also, some local residents had expressed concerns about the possible nuisance that such a Sports Club might cause. So a further appeal was submitted, this time by written representations in which the Association brought evidence to show that it had operated a Sports Club in Chandos Avenue for very many years with impeccable licensing records, and with no history of causing problems to the neighbours. The Association arguments were accepted and planning consent was granted. A team of professional consultants was then appointed to deal with the tenders for the development of the sports facilities, and a leading consultancy on Sports Ground development was appointed to ensure that the contracts for groundwork specified adequate land drainage, given the inherent waterlogged nature of the site. Construction commenced in 1987 and there was a short period when the Association’s Sports Clubs were without their own facilities. Fortunately the Clubs were temporarily accommodated at other sporting facilities. The opening of the Coopers Lane facility was marked by a festival cricket match between the School and the Old Boys in September 1988. On the afternoon of that match some 400 runs were scored on the new cricket table, thus confirming the quality of the groundwork. The budget for the project had been set so as to ensure that ample funds were available to complete a good quality scheme. However, at that time there was a special development land tax in force. This related to any land sale where inherent development value arose. Since this tax could have been well in excess of £100,000, expert advice was taken so as to create a structure that would legally minimize the exposure. The Association’s budget, however, still had to accommodate this risk. Fortunately, shortly after that time the tax was abolished. Rather than increase the immediate expenditure on the ground, the Committee decided on a policy that would retain an investment fund that would offer future financial support to the clubs. The development was completed on time within the allocated budget and with a retained surplus in excess of £200,000. For reasons of tax efficiency the financial arrangements were that the Association would purchase and develop the ground, using funds loaned to it by the Old Owen’s Sports Club Limited, the vehicle created by the original pioneers and which remains in being today. A small amount of money was allocated to the individual clubs to help them reinstate their activities after the gap in activities caused by the lack of facilities during the development period. An investment fund of around £200,000 was created to provide an opportunity for support income when needed. This fund is administered by the directors of Old Owen’s Sports Club Limited, who have skilfully protected its value, despite making donations to assist the Association, where appropriate. It is appropriate to reflect on the situation whereby the ability of Old Owens Association to finance the acquisition and development of the new facility was almost entirely due to the generosity and foresight of the Football Club members who set the company up in the 1920s. Since that time, the only financial contribution received from the members was the response to the appeal for the construction of the new pavilion in the early 1950s. 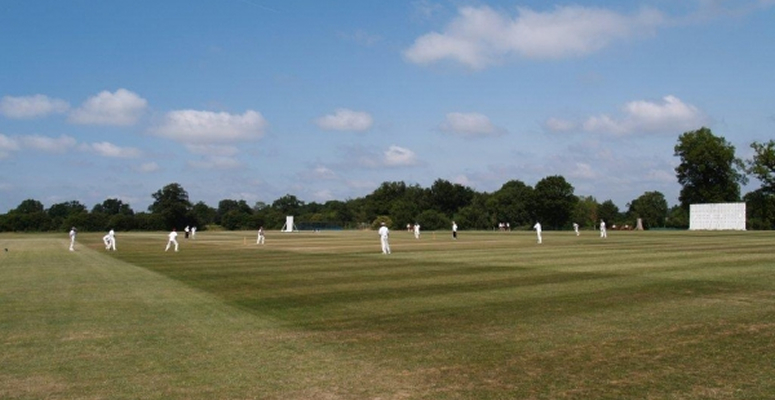 The Old Owen’s Sports Ground is now well established as a favourite sports venue in the South Herts. district, appreciated by club members and visiting teams alike. The Clubhouse has also become a social hub for the older school members, plus old boys and girls, thus fulfilling the functions to which the Association committee aspired when organising the move. This article was kindly provided by Old Owenian, Brien Martin (1946-1951). Brien was directly involved in all aspects of the move from Chandos Avenue to Coopers Lane. Sadly Brien passed away on 4th June 2016 but will be remembered for all the work he did in preserving the Old Owen’s Association, as a playing member, director and a long-term supporter of the Association.